A graduate of the University of Texas at Austin, Steve Fuqua earned both a Bachelor of Business Administration in Accounting and a Master of Professional Accountancy - emphasis in Taxation. Steve used his national firm experience to establish his own firm and has been a shareholder since 1981. Steve's services include personal financial planning, tax planning, and litigation support. 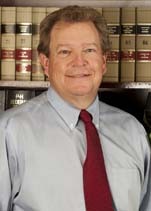 He also serves as an expert witness in many legal cases. Health care, real estate, entertainment, and professional groups are just a few of the industries Steve Fuqua serves. Steve is also a member of the AICPA and the TSCPA.